The Drexel University men’s and women’s swimming and diving teams competed at the Patriot Invitational in Fairfax, Virginia, Nov. 15-17. Both teams had an overall second-place finish behind Colonial Athletic Association rivals University of North Carolina Wilmington. The women’s team came away with five gold, six silver and seven bronze medals. The men’s team brought home six gold, three silver and five bronze. Last season, at the 2018 CAA Championships, the Dragons placed ahead of UNCW. The results of the Patriot Invitational will definitely help fuel the Dragons as they progress through the rest of the season leading up to the 2019 CAA Championships. On the first day of competition, winners were crowned in the 200-yard freestyle relays, 500-yard free, 200-yard individual medleys, 50-yard free, 400-yard medley relays, the women’s 3-meter dive and the men’s 1-meter dive. The women’s swimming team showed great strength in the 200-yard freestyle relay coming in second behind UNCW in a very competitive field. In the 200-yard IM, senior April Forsthoffer and junior Alicia Diaz took second and third, respectively. Forsthoffer placed ahead of Diaz by only 0.18 seconds but was behind first-place winner Danica Garbett from Florida Atlantic University by just about a second. The women placed first in the 400-yard medley relay with a time of 3:44.77 ahead of UNCW who came in with a time of 3:46.47. The men’s swimming team also had a good showing on the first day. In the 200-yard free relay, Drexel came in third behind UNCW and George Mason University. Less than a second separated first through third place. Senior Patrick Cobb swam to a second place finish in the 500-yard free with a time of 4:31.62. Junior Jason Arthur had a fantastic swim for a first place finish in the 200-yard IM. His final time was 1:48.22 which was almost four seconds ahead of the rest of the field. Matching the women’s team, the men also claimed first place in the 400-yard medley relay. The men had an incredible finish by a narrow margin of only 0.43 seconds ahead of UNCW. On the second day of competition, teams competed in the 200-yard medley relays, 400-yard IM, 100-yard butterfly, 200-yard free, 100-yard breaststroke, 100-yard backstroke, 800-yard free relays, the women’s 1-meter dive and the men’s 3-meter dive. The women’s team opened the second day with a team win in the 200-yard medley relay. In the 100-yard fly, Forsthoffer took another second-place finish with fellow senior Charlotte Myers in third place. UNCW’s Vivian Louviere touched the wall just 0.37 seconds ahead of Forsthoffer. The next win of the day came from sophomore Gabrielle Rudy in the 100-yard breast with freshman Megan Sicinski earning a third-place finish as well. In her dominance, junior Alexa Kutch took first place in the 100-yard back two seconds ahead of Diaz for a one-two finish. To cap the day for the swimming events, the women placed third in the 800-yard free relay behind Seton Hall University and the University of Maryland Baltimore. On the men’s side, the team placed third in the 200-yard medley relays just 0.21 seconds behind second-place finishers from George Mason. In the 100-yard fly, freshman Paris Raptis placed second with a time of 49.40 seconds just behind William Countie from UNCW. Cobb slipped out of the top standings in the 200-yard free as he only managed to grab sixth place in the finals. Senior Ralph Cannarozzi III took first in the 100-yard breast just breaking 55 seconds. Arthur earned second place in the 100-yard back behind UNCW’s Countie. The men finished the day with a third-place finish in the 800-yard free relay behind George Mason and Seton Hall. On the final day, athletes competed in the 1,650-yard free, 200-yard back, 100-yard free, 200-yard breast, 200-yard fly and 400-yard free relays. Another one-two finish from Kutch and Diaz occured in the 200-yard back. Kutch swam out in front to finish with a time of 1:56.65 with Diaz behind in 2:00.23. Rudy took third place in the 200-yard breast. Forsthoffer bested Florida Atlantic’s Garbett in the 200-yard fly touching the wall just 0.18 seconds ahead for a second-place finish. In the 400-yard free relay, the Dragons came in third place with a time of 3:28.76. UNCW took first place with American University in second. The men completed the day with a fourth-place finish from Cobb in the 1,650-yard free. Arthur took first in the 200-yard back with a time of 1:45.54 which was over a second ahead of second-place finisher Alexander Gliese from UMBC. Junior Stathis Malamas finished in fourth only 0.53 seconds behind first place in the 100-yard free. Cannarozzi placed third in the 200-yard breast with a time of 2:02.78. Raptis took first in the 200-yard fly ahead of Connor Forsythe and Noah Cahan from UNCW. In the 400-yard relays, the men finished in third place, behind UNCW and George Mason yet again. Overall, the women’s team had 24 personal best times with 76 season bests. The men also had 15 personal bests and 111 season best swims. The Dragons sent Kutch and Rudy from the women’s team and Cobb, Malamas, junior Joe Short, senior Joseph Brown and Cannarozzi from the men’s team to compete at the 2018 AT&T Winter National Championships Nov. 28 to Dec. 1. 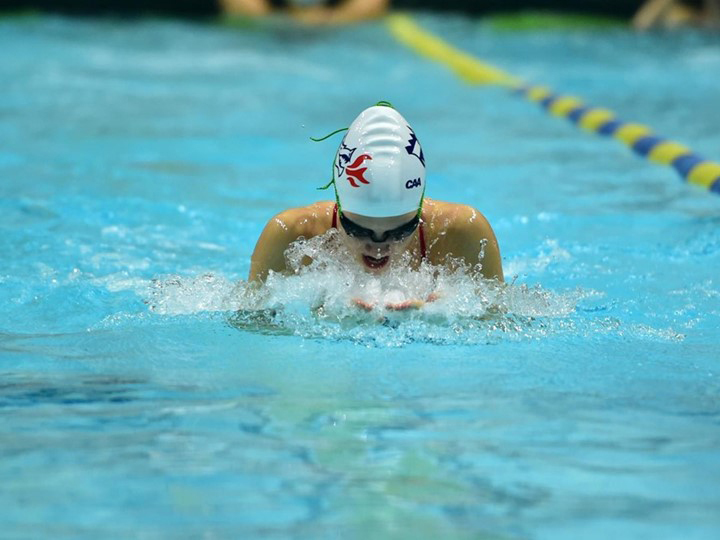 To begin the new year, the Dragons will host two CAA teams: Northeastern University and the University of Delaware Jan. 5 at noon at the Daskalakis Athletic Center pool.